Did you think Temecula only had wineries? Temecula has several wedding venues that don’t grow grapes for purposes of making wine. 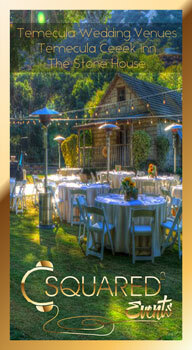 The Stone House at Temecula Creek Inn is one of the most popular venues. Couples from all over the country flock to this site for its one of a kind charm. Join us as we take a walk around this beautiful location. Fun fact, the photo you see on the intro card above was taken by our very own Mike Carroll. Temecula Wedding Venue Temecula Creek Inn Stone House from C Squared Events on Vimeo.